Solutions for fix HTC DESIRE 516 DUAL problems. HTC start to give more acceptable price for good smartphone, then they produce HTC DESIRE 516 DUAL to the market. This is the smartphone with 5 inches LCD screen and as usually the wonderful user interface of HTC Sense 5.1 already included at this phone. But we are get little disadvantage of HTC DESIRE 516 DUAL because it has only 4 GB internal memory, but maybe this situation will not become worse because it have MicroSD card slot to expand some memory capacity. The HTC DESIRE 516 DUAL have 1 GB RAM for multitasking applications and use quad core processor with 1.2Ghz clock speed. How to Fix or Problem Solving for Recovery HTC DESIRE 516 DUAL hang or not responding or malfunctions or stuck or freezing or bricked ? The HTC DESIRE 516 DUAL have some factory default applications, but we still can add more apps which can download from Google Play Store. Because Google is more open for any developers to upload their creation to Google Play Store, then sometime their applications not always compatible with our HTC DESIRE 516 DUAL, therefore our phone will become problem after install some applications like hang or stuck or bricks or broken or blank or boot loop or LCD touch screen not responding. At this situations we have to force soft reset or force shutdown the HTC DESIRE 516 DUAL to clean temporary files or caches. If the problem still happen, then we have to do hard reset or master format. If we have many important data, we have to do backup and remove the external memory before performing hard reset, because all important data will be removed. 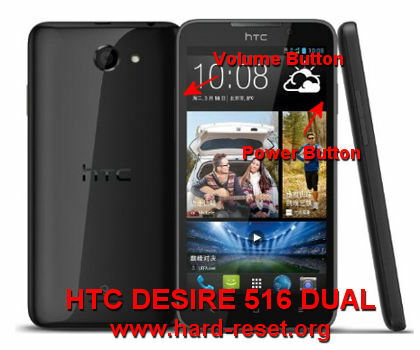 How to Force Soft Reset or Force Reboot or Force Restart HTC DESIRE 516 DUAL ? When we use HTC DESIRE 516 DUAL but suddenly the application hang or freeze or stuck. Then we have to force shutdown HTC DESIRE 516 DUAL by remove the battery after open the back case cover. Wait about 5 seconds and put again the battery at the right positions, after that press POWER button to turn on the phone again. Doing soft reset like this will restart all applications from beginning and also will remove some temporary files or cache that can make trouble to this phone. Doing soft reset or reboot or restart also can be done when the phone not get trouble or at normal situations, by press and hold POWER button and we will see pop-up menu, choose Shutdown or Reboot button then the soft reset will be run. Doing soft reset or reboot is safe because it will not remove or delete or wipe any important data and applications. The HTC DESIRE 516 DUAL will do the master reset for several minutes, just wait until it finish. How to Deal With HTC DESIRE 516 DUAL Internal Memory Full or Insufficient ? Having internal memory 4GB is very limited, because it will become insufficient after install some applications. Maybe some standard users will not get the problem at beginning, but after use several period, the memory internal memory of HTC DESIRE 516 DUAL become full. If we already get this problem, then this time for use to reduce the installed applications. But how about if the internal memory of HTC DESIRE 516 DUAL still insufficient after removing or uninstalling some applications? Please note that some applications like Facebook, Google+, Twitter or something like this will keep data at internal memory, after using several period the data will be become bigger and will make the internal memory full, that is why we have to clean data for that applications to reduce the internal memory usage from Setting Menu > Applications and remove their data and cache, but this problem will back again after we re-login again at that applications. There are also one solutions to do this, by moving the installed data or cache to external microSD memory, but unfortunately this need our HTC DESIRE 516 DUAL to be rooted, and we are not recommended to do root, because some wrong steps can make our phone become trouble or not run properly, please becareful to do that. How to Restore and Reinstall Clean Android Operating system / firmware at HTC DESIRE 516 DUAL (Reformat) ? The factory default Android operating systems at HTC DESIRE 516 DUAL is Android Jelly Bean. We have to know that the file source of Android Jelly Bean already save safely at HTC DESIRE 516 DUAL ROM. We do not need to copy or connect from other device if we need to reinstall or reformat or restore clean factory default Android operating system when the OS damage or broken. Just follow the steps to hard reset above, then the clean and factory default Android operating system or firmware will be reinstall automatically. Please backup all important data and remove the external memory card before doing reformat or reinstall the operating system. How to Unlock or Fix or Bypass or Solutions for HTC DESIRE 516 DUAL forgot password code or security lock screen pattern or pin (lost password)? That is always important to give more security protection for our HTC DESIRE 516 DUAL. We can choose several options to protect, but we are recommended to use screen lock pattern because more faster to open and easy to use. But some users still like to use password pin protection. The problem happen when we forget about that protection. How to bypass or unlock it? Do not worry because Android already have way out to unlock or bypass forgotten screen lock pattern or password pin security protections using Google account. Please try to give several time wrong answer continuously until the phone freeze or locked about 30 seconds, at this time we will find Forgot Password / Pattern button. Press this button, then the HTC DESIRE 516 DUAL will ask for Gmail username and password that we have already signed in before. If we can not access Google account, then we have to do hard reset using hardware button above. How to Improve Performance HTC DESIRE 516 DUAL to make run more faster? For daily usages, the performance of HTC DESIRE 516 DUAL is good, but after use several period, some users have problem that the speed become slowly. Usually this problem happen because there are too many applications run, especially the applications which run in the background. Some applications that we have downloaded from Google Play Store will keep run in the background without any notice, because they have to wait for some command and update data. All applications will need some amount of RAM and processor resources, if there are too many applications run in the background, then the RAM and processor resources will be insufficient and make the HTC DESIRE 516 DUAL performance become slowly because phone need to share the RAM and find which apps not use anymore. Therefore we recommended to install only important applications, please uninstall not use one. If we want to make the HTC DESIRE 516 DUAL performance run faster again like new, then we need to consider performing hard reset or master format. Is That Any Secret Code for Doing Format HTC DESIRE 516 DUAL ? There is no secret hidden code for HTC DESIRE 516 DUAL to make it back to factory default. Do the options above to hard reset it. How to make Longer Life for HTC DESIRE 516 DUAL Battery Saving Not Fast to Drain ? We have to know, the LCD screen is the most drain conditions for our battery, that is why we have to adjust the LCD screen not too bright, use as low as possible. Please turn off some not use features like Bluetooth or Wifi or GPS to safe the battery live an can work longer before charge. Using 3G also will need more battery resources, if the battery level is near empty but we are away from charger, then try to change the data connection become 2G only. How to Upgrade HTC DESIRE 516 DUAL to Android Kitkat or Lollipop ? The factory default Android operating system version of HTC DESIRE 516 DUAL is Android Jelly Bean and until we write this information, the HTC DESIRE 516 DUAL still not get official Android Kitkat and Lollipop as well. But we can wait or try to find the latest firmware OTA (over the air) update from menu Setting > About phone > Software update. [A] Hi, unfortunately bring to HTC authorize service center was correct steps when your phone get some trouble, but if still not fix then maybe some other trouble happen with your phone, we suggest to consult again your trouble at that HTC service center for further fix. The information from this page describe about HTC DESIRE 516 HARD RESET,how to root htc desire 516,htc 516 hard reset,root htc desire 516 dual sim,how to root htc desire 516 dual sim,htc desire 516 root,how to hard reset HTC desire 516,HTC Desire 516 dual sim root,htcdesire516 unfortunately cancel. If you need another resource for hard reset, use search function at this homepage or find from our related posts. How to Easily Activate Picture in Picture (PIP) at XIAOMI MI A1 ? Hi, unfortunately we can not give good answer for rooted problems, because some non standard possibilities may happen. Please consult with HTC authorize service center for better answer. Or you can ask from other community like XDA Developers. Hi, at normal conditions, doing hard reset will reformat your HTC Desire 516 operating system to factory default. Please follow steps by steps carefully using hardware button combination key at #option 2 above. If after finish hard reset but the problems still happen, then maybe your hardware get some trouble, please consult with HTC authorize service center. Hi, unfortunately bring to HTC authorize service center was correct steps when your phone get some trouble, but if still not fix then maybe some other trouble happen with your phone, we suggest to consult again your trouble at that HTC service center for further fix.